A bustling building full of people, hallways, lights and learning. 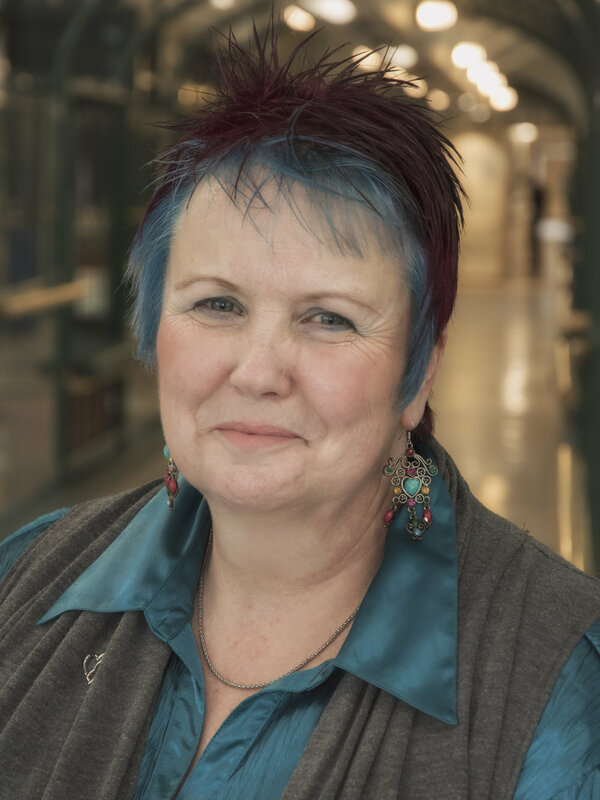 The first and only planned appointment of this past Tuesday was in the late morning with the unforgettable Lori Ives-Baine, (RN, BScN, MN (CPB) Grief Support Coordinator, PACT, Pathways Grief Support Program) Hospital for Sick Children (Sick Kids) in Toronto. Lori is a lifeblood of the hospital and has been working there for almost 30 years. As I waited in the hallway for her to find me I realized I had no idea what she looked like or how I would recognize her. I messaged her that I was wearing black (common suspect) and she messaged back I couldn’t miss her. She was a bright rainbow of colourful hair, wrapped in a brilliant fuchsia scarf, with an inviting smile on her face. We didn’t have long, but in the hour we spent sharing stories and talking about some difficult subjects, we were both able to have a brief glimpse into each other’s worlds. Lori is another heroic member of society who shows up everyday to support families at The Toronto Sick Kids. As a nurse, Lori found herself gravitating towards caring for critically ill children and their bereaved families. She has been working in grief and bereavement for 25 years of her career with the majority in the NICU (Neonatal Intensive Care Unit) . Over time the bereavement program grew beyond the NICU, extending to other units and then across the entire hospital, which Lori has now been supporting for the past five years, so that everyone that has lost a loved one can have access to the same support, compassion, dignity and care. Her talents and work in this area have brought clinical expertise, programs and processes to the various units throughout the hospital. On some days, her compassionate care program extends beyond the hospital walls to reach and support children who were formerly Sick Kids patients but may have passed elsewhere. When I began to ask Lori questions I shouldn’t have been surprised by her brief but impactful answers. Her knowledge and expertise were evident. She shared of the beautiful and varying memorial services the hospital hosts throughout the year. Thoughtful gatherings from releasing butterflies at picnics to hospital wide candlelight celebrations. It made me glad to know that for a moment these families would be part of something so special as they courageously celebrate the life of their lost little loves surrounded by others that have walked their path. What would a typical day look like for you? I asked. To which Lori replied “there is no such thing as a typical day. They are all different”. When she reflected on what her high level plan is for everyday she shared that “her job is to make sure that the parents have no regrets at the end of the day.” A powerful and touching response that struck a chord deep within me. She shared her hopes that if her job is done right “parents are aware of all the options” and have the ability to make the hardest decisions of their lives. Whether it be “one last walk in the park or having a TV brought in to watch one last hockey game together” Lori works hard to make sure she can help these families to the best of her ability. She smiled as she shared that “LOVE” is the most common theme across the families, “a love so strong that they can let them go”. She also shared, with great respect, the RESILIENCE she sees in all of them. As I left the doors of the hospital, my afternoon took a path I hadn't planned nor ever expected. Stay tuned for PART 2, where I share a beautiful twist of events that lead to a very synchronistic day.